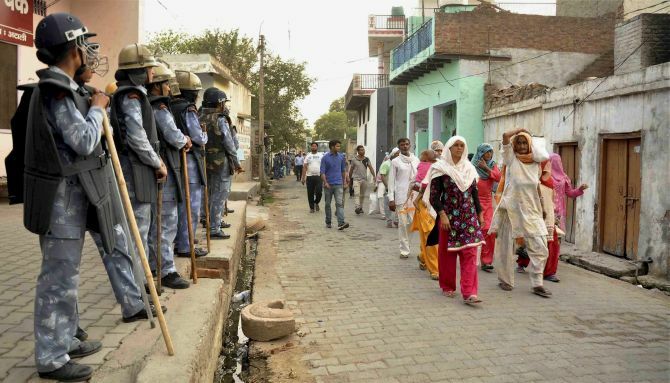 Rashme Sehgal reports for Rediff.com on the violence which devastated Muslims in a Haryana village. Image: Muslim families, driven out from their homes by the violence, return to Atali village on Thursday, June 4, 10 days after clashes broke out. Photograph: PTI Photo. Trust between the conservative Jat farming community and the Muslim community across the parched plains of north India seems to be diminishing by the day. The Jat-dominated Atali village near Ballabgarh in Haryana was witness to this rapidly shrinking trust between the two communities when the construction of a mosque triggered a wave of unprecedented violence against the Muslims. Describing the mob fury that was unleashed on the Muslims on May 25, 70-year old Hasina Mohammed, a mother of eight grown-up sons and one daughter, said, "A group of armed men carrying axes and country-made pistols attacked our house. They broke the front door and threw petrol bombs and a gas cylinder that torched our house. We locked ourselves in the back portion of our house. It is a miracle that we all managed to escape." Hasina's sons tried desperately to call the police. They got no response. They remained locked in the room for several hours before being rescued by the Provincial Armed Constabulary which brought them to the Ballabgarh police thana where they have been camping ever since. Hasina's neighbour, 45-year old Ayesha, was also in the house along with her six children when she heard loud shouts and a mob charge into her house. "It was around 5.45 pm. They broke down the front door so my children and I took refuge on the roof. We remained on the roof while we heard all the items in our house being broken and the window panes being smashed one by one." Ayesha and her family, including her husband who works as a motor mechanic, were rescued by the police and brought to the Ballabgarh police thana where she along with 200 Muslim men, women and children stayed till June 4. "Women with children were crying for help from their rooftops and many of them suffer from burn injuries," says Shakir Ali, another victim of the violence. At the heart of the violence that rocked Atali village is a small Muslim shrine which the 400-strong Muslim community was keen to develop into a larger mosque. The shrine had existed at the site for the last 50 years, and the Muslims had collected Rs 600,000 to build a larger mosque. Sabuan Khan Abasi, a social worker with the Akhil Bharatiya Welfare Association who has been helping organise food and clothing for the riot victims in Ballabgarh, pointed out, "Even though the Faridabad district court has ruled that the land belongs to the Waqf Board and we are within our rights to construct the mosque, this has not gone down well with many of the Jat farmers of Atali." What Abasi did not say, and which is something the 400-strong community sheltered in the police thana is unanimous about is that the coming panchayat election being fought between two Jat candidates -- Rajesh Chaudhary and Pehlad Singh -- is primarily responsible for triggering this violence. Chaudhary, the current sarpanch, has been canvassing for the Muslim vote and had openly supported the community. Singh has been canvassing for the 2,600-strong Hindu vote and is opposed to the mosque's construction, claiming the land belonged to the gram panchayat which does not want a mosque coming up there. When Chaudhary supported the mosque's construction at a panchayat meeting, he was attacked and fled the village. The First Information Rerport lodged at the Ballabgarh police station states that a mob of 2,000 armed people began pelting stones on homes and the shrine where the Muslims had gathered to pray. 'In a little while, around 2,000 people gathered there,' the FIR stated and within 30 minutes the mob had succeeded in destroying 20 houses, three cars, one tractor trolley, two tempos, 15 motorcycles and two shops. The FIR has named six individuals who reportedly attacked Muslims with weapons, but the Muslim men and women who sought shelter at the police thana repeatedly declared that the police had made no arrests so far. 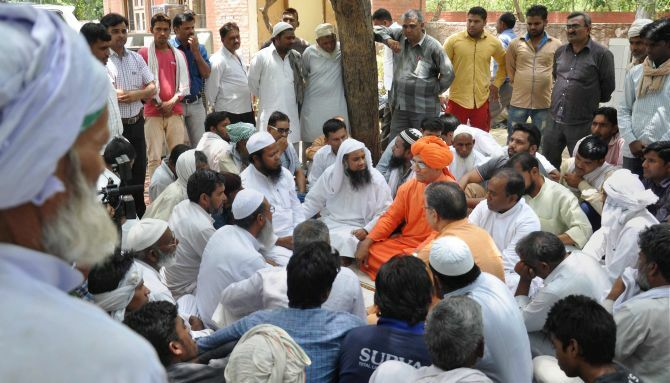 Image: Swami Agnivesh (in saffron robes) meets Muslim families affected by the communal violence in Atali village. Photograph: PTI Photo. Conspiracy theories are rife, with several Muslim villagers insisting that during the period the mob was on a rampage their repeated calls for help to the village police went unheeded. Shakir Ali, a victim of the violence, maintained, "It was a deliberate conspiracy. The mob targeted large houses, burning down ACs, fridges, almirahs and furniture." Other villagers subscribe to this belief. Shakir Ali points out that on May 20, a meeting took place in the village between Deputy Commissioner of Police Bhupinder Singh and villagers from both communities at the Ballabgarh police station. Rajesh Chaudhary had then taken up the case for the mosque, and construction work started the following day under police supervision. Jarima Mohammed, a mother of four, pointed out, "From the day the construction started, the entire Hindu community began to boycott us. We were not being given mobile recharges, our water and electricity connection was stopped, and food supplies like atta from the local chakki was also stopped." "This was a clear warning to us that matters could turn nasty, but we did not understand these signals. Earlier also, our village had witnessed many arguments over the construction of the mosque so we felt we would tide over this crisis." Sagiran, the activist chairman of the Akhil Bharatiya Muslim Yuva Ekta Committee, warns, "There have been several rounds of peace discussions between the administration and members of both communities. Atali village elders want Muslims, who work largely as daily labourers in farming land owned by the Jats, to return to their homes. Muslims also look after their cattle and do other menial jobs. They have shared an economic bond for generations. But the younger generation in Atali does not want these Muslims to return. They do not share any kind of cultural affinity with them." Construction of a mosque triggered off tremendous tension between the two communities in the Qadalpur village of Greater Noida in 2013. The then sub-magistrate of Budh Nagar, Durga Shakti, had reportedly ordered the breaking down of a masjid wall under construction, leading to her suspension by the Akhilesh Singh government. Jats and Hindus do not have a history of communal riots. The situation changed dramatically in 2013 following the riots in Muzaffarnagar which saw several thousand members of the minority community being displaced. Following these riots, several hundred Muslim families migrated to Haryana which they believed offered them a safer haven. Speaking soon after the riots, former Uttar Pradesh minister and Rashtriya Lok Dal leader from Baghpat, Kawkab Hameed, admitted that the mutual trust between Jats and the Muslims was destroyed after the communal riots in and around Muzaffarnagar, Uttar Pradesh, with several villagers migrating to Haryana. Swami Agnivesh paid a visit to Atali on Wednesday, June 3, and told the panchayat leaders that they have no choice but to follow the law of the land. "With the courts having green-signalled the construction of a mosque, they should abide by the decision in a peaceful manner," he said. For the present, the state administration has begun repair work on the mosque from June 4 and also persuaded Muslim families to return to their homes. Though terrified, they have returned to their homes under tight security, but remain apprehensive that the "real situation" will come to light once the security cover is withdrawn.